Reliance Jio has pipped incumbent telecom operators—Bharti Airtel, Vodafone and Idea Cellular—in terms of 4G download speeds in the month of February at 16.48 Mbps, which however declined marginally from 17.42 Mbps in January. The fresh data assumes great importance amid the ongoing battle between Reliance Jio and Bharti Airtel over the latter’s TVC based on Ookla findings terming it India’s fastest 4G network of 2016. Recently, ASCI, which the advertising watchdog, asked Airtel to remove or modify the television commercial by April 1, acting on a complaint filed by Reliance Jio, which said that the TVC was misleading and was done in “mala fide manner in collusion with” Ookla. A committee of the Advertising Standards Council of India (ASCI) ruled that the TVC and website advertisement contravened ASCI rules. Reliance Jio had already sent a legal notice to Ookla for “falsely” certifying Bharti Airtel, despite knowledge that its test results are fundamentally flawed and unreliable. 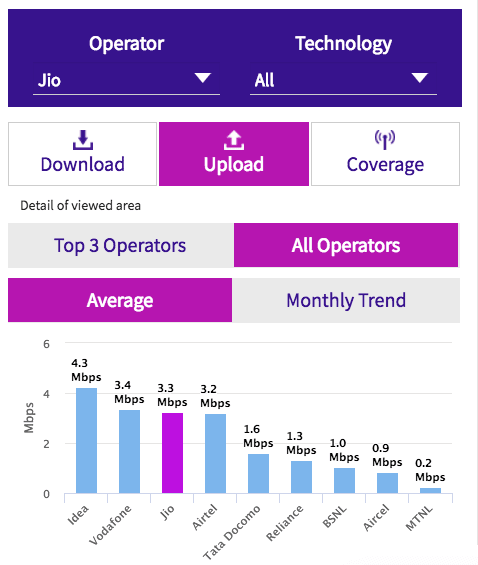 According to the speed tests conducted by various users in TRAI’s MySpeed application in February, Jio is way ahead of other operators with speeds of 16.48 Mbps. Though the speeds are down from 17.42 Mbps recorded in January; the operator is still the leading network in India. That said, the speeds of Jio are double the speed of other players. The download speed of Idea Cellular is 8.33 Mbps, and Bharti Airtel is 7.66 Mbps occupying the second and third place. That said, the download speed of Idea and Airtel has seen a massive dip in February when compared to those of January. Vodafone India secures the fourth place with average download speed of 5.8 Mbps, which also saw a downfall from the January’s 6.13 Mbps. Reliance Communications, Tata DoCoMo, and BSNL are the last ones on the list with average download speed of 3.4 Mbps, 2.5 Mbps, and 2.4 Mbps respectively. Speaking about the upload speeds, we have a surprise here. Idea Cellular is topping the chart with upload speed of 4.3 Mbps, which is followed by Vodafone with 3.4 Mbps. 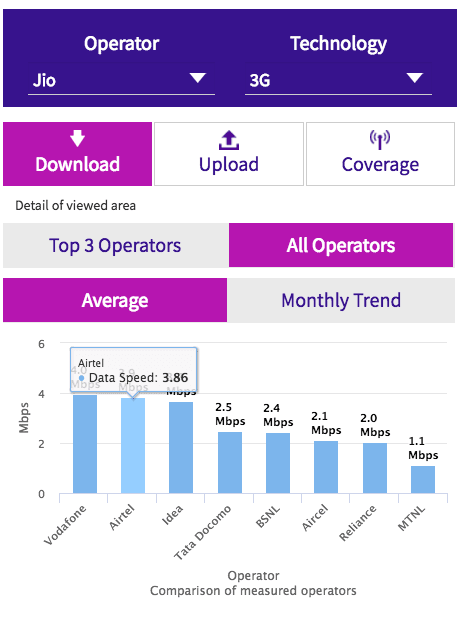 Reliance Jio is in third place with upload speed of 3.3 Mbps, which is closely followed by Airtel with 3.2 Mbps. 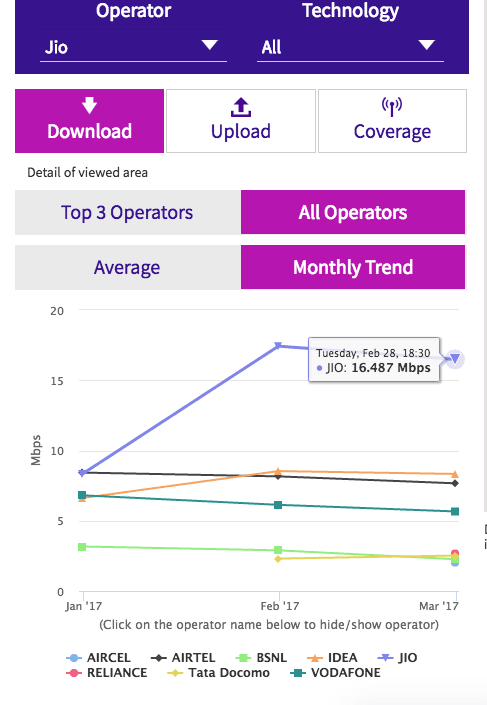 If we consider the average upload speed of every operator in the month of January, Jio has seen a substantial rise of over 1 Mbps from the previous 2.208 Mbps. All the other operators are offering the same upload speeds as January. Speaking of the speeds in only 4G technology, Jio still tops the chart with average download speed of 15Mbps, followed by Idea and Airtel with 11.93 Mbps and 10.69 Mbps speeds respectively. Vodafone is offering 8.1 Mbps 4G speeds, whereas the Anil Ambani-led Reliance Communications is providing 4G speeds of 3.9 Mbps. In the 3G areas, Vodafone India is offering better speeds than other at 4 Mbps. Next up to Vodafone is Airtel with 3.9 Mbps, and Idea with 3.7 Mbps. These TRAI speed test results will settle the nerves of Reliance Jio a bit as the operator is heavily complaining about Bharti Airtel’s title as India’s fastest 4G network by Ookla. The company has approached advertising watchdog ASCI regarding the Airtel’s TV Campaign on the ‘fastest 4G network in India’, claiming it as misleading. That said, ASCI has already asked Airtel to pull down or modify the Ad before April 11, 2017. It’s interesting to see what Airtel claims in coming days. What do you mean by free jio offer? I am residing in the heart of the town of berhampur Orissa. But I have never seen 1mbps speed of jio. Always 0 Mbps speed. After complain also not rectified by jio team. But without complain his rible are giving network. By giving money to trai to advertise jio speed is good told. May trai has tested under the tower of jio and told like this.